I just love the fall. It reminds me how everything deserves time to slow down and rest. That if you are weary you can let go and if you worn out you can cozy up in comfort. One of my favorite ideas that is trending is the wardrobe capsule.The French Women have a monopoly on this idea. I will admit I have played around with this idea for a few years now. This is what I have learned…. 1 Find your style first. How do you know? Easy! Are you childlike, bubbly, and playful; shabby chic, feminme, and romantic; a bombshell, bohemian, or trendy; or are you classic, sleek, and sophisticated? There are many books and online tests to help define your look. 2. Clean it all out. You know what I mean, pull everything out and start sorting. My only rules for this are as follows, you have to absolutely love what you keep, it has to be in great condition, and it has to fit. The rest can be donated or recycled. Consignment shops are great too. 3. Buy new hangers. I love the flat velvet ones. Then my clothes don’t slip off, and you can cleanly store a lot in a small space. 4. Hang clothing in categories shirts, pants, skirts, jackets,and dresses. Hang them in he rainbow pattern ROYGBIV. 5. Set aside a space to hang your capsule for the season. It should be about 3 feet wide with a top and bottom rack. You can choose tops, bottoms, jackets, and dresses. The idea is to keep it small. I tried project 333 and I just never could fit my accessories and shoes inot the number 33. So I usually choose about 35 iteams of clothing and I add 5 pair of shoes. So 40 is my magic #. I do not put a limit on accessories, I consider them essential to stretching a capsule wardrobe. 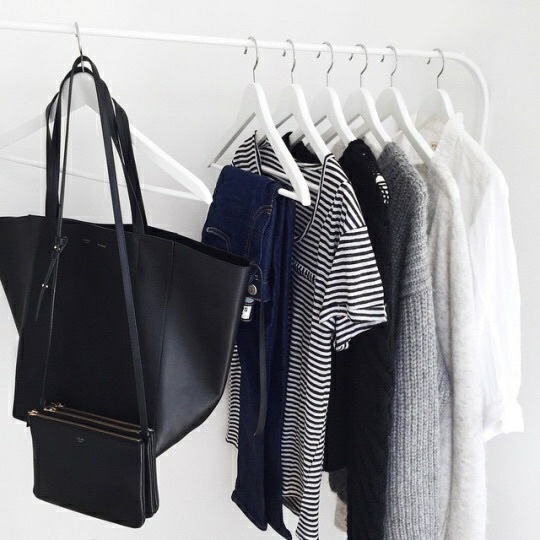 6 Now look through your closet and pick out 5 favorites for fall. These are your signiture pieces.Or these can be your new Trendy pieces. All the rest will be chosen to complement or enhance your favorite 5 pieces . I love looking forward to each season when I get to shop my closet and build my capsule. I usually buy 3 trendy items for my capsule each season. I also make myself get rid of something for every item new I buy. It keeps down the clutter. Simplicity is the way of the French women. They don’t overindulge, just discriminate in quality when they shop. Lessons to learn: keep it simple, use neutrals a lot, buy quality not quantity, and wear what you love! There you have it! Capsule Wardrobing 101. Now go shop your closet and get ready for a charming fall!